It’s hard to rescue someone when you’re not even sure if he’s still alive. The best scenes in this novella involve foreshadowing so subtle that their messages are extraordinarily easy to miss. Ms. Bidwell made me feel a deep sense of foreboding before I had any idea what her characters might be facing. What makes her work unique is that discovering what caused my dread only made me fear it more. There was no comfort to be found in knowing the answer to this question, and for that reason this tale will stick with me for a very long time. The introduction of a large number of characters in the beginning slowed down the pacing of the first third of this book. Not all of the relationships between the characters are immediately clear, so I had trouble at first remembering who was who. Because the adventure begins as the characters are travelling to their destination, the combination of a relatively large group of people and the amount of time it took to set up who they were and why they were on this mission made the first third of the plot feel like it was moving much more slowly than this reader ordinarily expects from an adventure tale. With that being said, once the pacing picks up about halfway through the narrative I couldn’t put this book down. Old rivalries and allegiances among various members of the main cast of characters are illuminated as they discover something they never would have imagined to exist. I didn’t realize that A Fistful of Dust was part of a series until I was midway through the plot. Figuring this out helped me understand why the first few chapters contain so many references to the character’s backstories without the text including any flashbacks to what sound like very exciting scenes. While this book can be read as a standalone novel, I am looking forward to going back to the first book in the series to discover exactly what happened to these characters earlier on in their adventures. 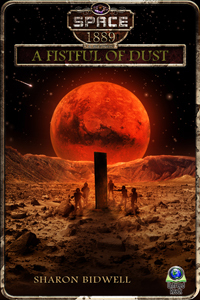 A Fistful of Dust is a good choice for anyone who loves the atmosphere and plot tropes of nineteenth century science fiction.